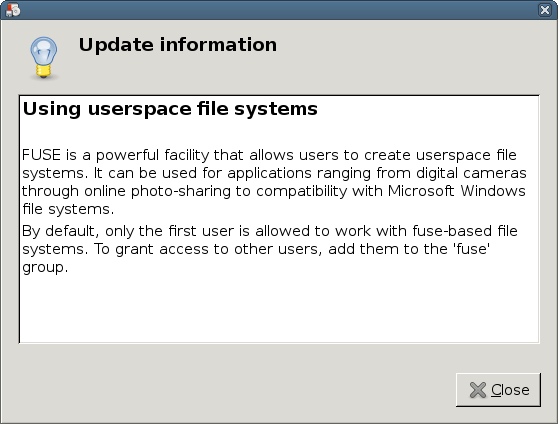 This dialog gets points for being graphical, and loses many, many, many points for presenting no information that any reasonable user could possibly get any use from unless they already previously understand (1) what FUSE is (2) how to get FUSE plugins (3) who the ‘first user’ is (4) what the ‘fuse group’ is and (5) how to add users to the ‘fuse group.’ And if you know all those things, you didn’t need the dialog, so kudos for being both useless and intimidating. Linux has come a long way (the upgrader helpfully offered to do a partial upgrade instead of complaining and dying like previous debian/ubuntu upgrades), but still has a long way to go too. That looks like a debconf note, and like the problems Gerv lists (conffile handling) show Ubuntu is a just thin wrapper around Debian, maintained by an organisation that doesn’t have enough manpower to create a coherent distribution. See also the cargo-culted stable update procedures that push the work of integrating stable versions and bugfixes onto the upstream developer (eg Abiword) instead of doing what a real distro does and managing it themselves. James: your characterisation of the Abiword situation is a bit off. Without any input from the Abiword developers, the latest release as of the Ubuntu beta release would have been included. The Abiword developers wanted a new major version in the release instead (a major version that they only decided to make after Ubuntu’s feature freeze: not the sort of thing that could be planned for). Having them take responsibility for some of the QA was an option that gave them what they wanted. It also appears to be the reason Fedora picked up the new release at such a late stage in its release schedule too.